"It’s November and Maggy Thorsen, co-owner of the Wisconsin gourmet coffeehouse, Uncommon Grounds, is in South Florida at an annual crime-writers’ conference with her beau, local sheriff Jake Pavlik, who is due to speak as a ‘forensics expert’. 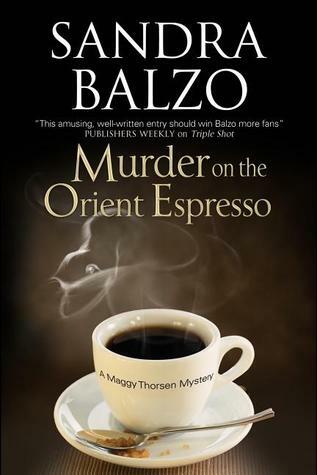 A mystery among writers, Murder on the Orient Espresso takes place at a Mystery 101 writer’s convention in which a reenactment of Agatha Christie’s Murder on the Orient Express is to take place. Things do not go as planned, and soon Maggy and her beau Sheriff Pavlik have a real murder on their hands. I found the book short and sweet, as in a good evening read for a stormy day. The plot was simple, and I loved the funny wit that was dispersed throughout. Maggy’s character is a real joy! Some problems I had to contend with were keeping up with the other characters. A lot of the time, their names were affixed to the characters in the Agatha Christie book they were playing, and unless you’ve recently read the book, it becomes very confusing. It’s been a good two years or so since I last read Murder on the Orient Express, so the characters weren’t all that fresh on my mind, although the murder and the plot were. Another thing that didn’t quite fit were the “clues” and the interrogations because, when it’s all said and done, they didn’t matter when it came to the murderer. The mystery wasn’t conventionally solved, and it felt very rushed at the end. The victim in this crime was described as so awful, that when I really thought about it, it didn’t surprise me who they were and throughout the book, I didn’t really care who did the killing. In all I liked the book for it’s humor, it’s relaxed read, and it’s pun on a classic mystery. This is my first Maggy Thorsen Mystery, but I can easily see myself reading her previous adventures for another cozy mystery book day. I’d recommend this book if you like quick reads, standard mysteries and witty women sleuths.